No matter how many toddlers, teens or canines live in your home, every room can look like it fits on the pages of Elle Decor or House Beautiful and still be enjoyed by every member of your family. Why leave the decked out living room for only the occasional guest? My Connecticut cottage is my cocoon, my refuge from the hustle and bustle of carpools, pediatrician visits and client meetings. I love to spend time in every room in my home and since a brood of three toddlers and two mutts follow me wherever I go, they feel at home in every space too. The advice I give my clients, and which I live by too, is to embrace the chaos of young and energetic households…plan spaces for the way you live, but do LIVE in every space. Then, this is the fun part, while planning your life add in a layer of sophisticated eye candy to cater to adult tastes, I like to call it the “Wow Factor” and every room needs one: exquisite trims, rich fabric and faux painting have a home in even the most boisterous space and when added thoughtfully do not need to comprise the life inside the home. I started this blog to address all those other design savvy mothers out there that may have a fabulously well styled closet but put the house on hold until juice boxes or skateboards were a faded memory. I am telling you…don’t wait! Embrace your home and do not compromise your design aesthetic. I plan to offer advice in this blog on some of the more vexing questions others moms have presented me with…like what do you do with bookshelves!?? or paint, yikes! as well as share some of my tricks for creating spaces, like your living room for example, that are comfortable for babies, cocktail party guests and Sunday morning lounging — all while looking completely fabulous. 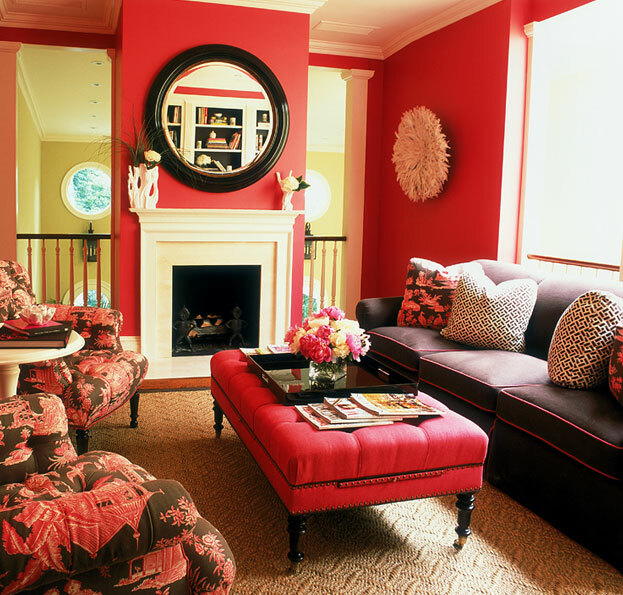 Here are some examples of rooms I adore, for different reasons. But if you look closely, most of them would stand up to life! I LOVE this playroom by Alessandra Branca. Why can’t the kids space look like a million bucks! The ceiling is a great place to spend your design capital with no fear of messy footprint. This is such a dreamy room for a little girl…can’t you just see the curtains pulled back before the show! Anyone would feel at home in this room with a glass of wine or story book. Ottoman coffee tables are a great way to beckon loungers into a room. Beautiful and brilliant just like you!! Love the brown sofa in the last photo! If I’m going to get a sofa reupholstered, are there fabrics you recommend that are more “spill/spit-up friendly” than others? You are a star Les! I love your work!! Brilliant! I’m not surprised by your talent! You’re a sophisticated woman with class and elegance. But it’s your good nature and authenticity that flows through your work that takes it to another level. Can’t you move to Atlanta?! I love your foyer “wow factors!” I’m desperately looking for something like that. Yours are unique, while incorporating an updated traditional flair. I no longer want my grandmother’s look with all of her furniture. Would love to keep the antiques but have liveable upholstery. You are so talented!!!! How exciting for you! This is a wonderful first post on your new blog and so beautifully written. What a talent you have! I look forward to following it and learning all kinds of great tidbits! I’m blown away by you! Fabulous.